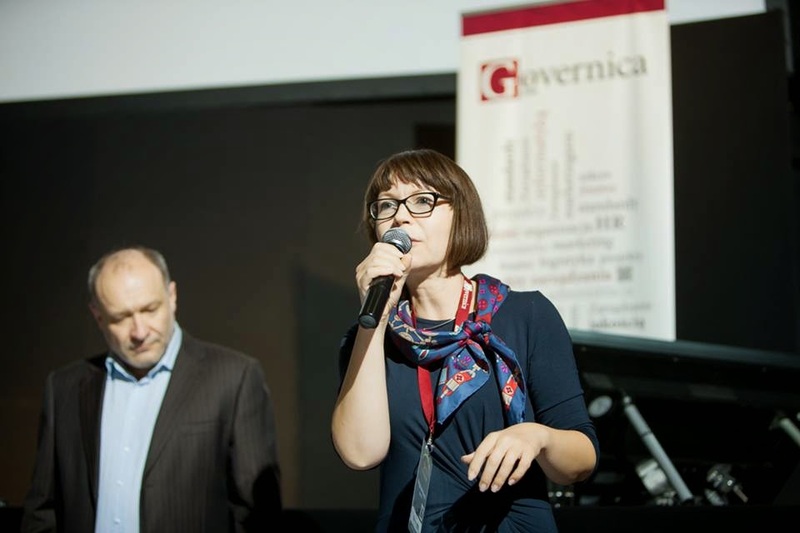 I had a pleasure to take part in the second edition of Agile Management 2014 conference organised by Governica and held in Warsaw, 17-18 September 2014, as the Program Board member and a round table facilitator. 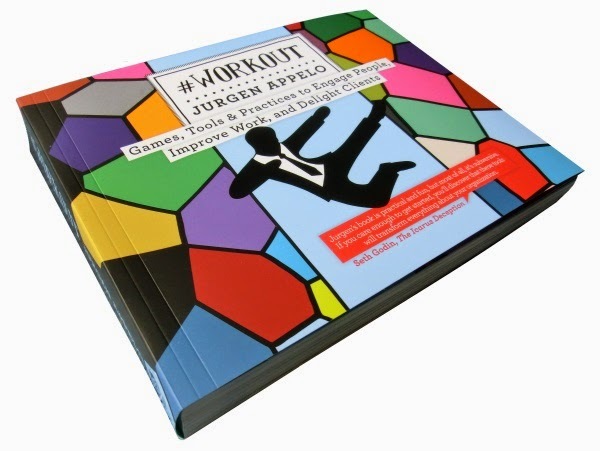 The keynote speaker Jurgen Appelo kicked off the event sharing some interesting tips from his book Management 3.0 Workout, which can be downloaded for free from here. Instead of Jurgen’s bio, let me share his definition of a Creative Networker as he calls himself. As the knowledge economy is fading and the interaction/creative economy gains ground, Creative Networkers are replacing Knowledge Workers. 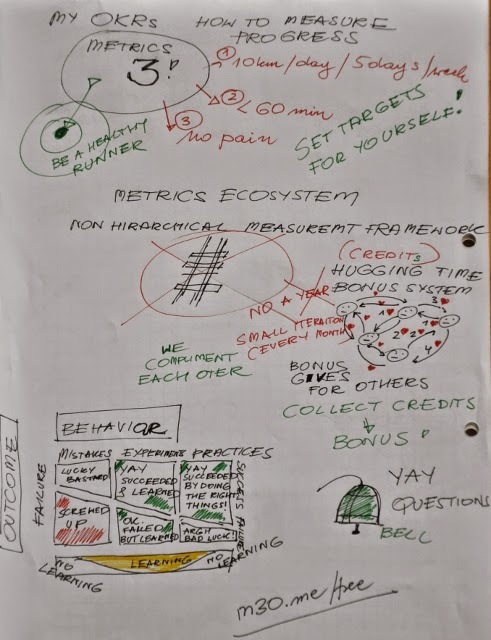 I have chosen 3 tips from Jurgen’s speech, some more in the drawings and far more in his book. Getting to know a person is critical to collaboration. Create a personal map of your colleague to narrow the mental gap. Write categories of interest such as home, education, work, hobbies, family, friends, goals, and values, and expand the mind map by adding more information you know about this person. By creating a personal map of a colleague, you make an effort to better understand that person. Delegation is not easy. A delegation board helps management to clarify delegation and to foster empowerment for both management and workers. The English verb “to manage” comes from the Italian “maneggiare”, meaning to handle and train horses. Managing an organization is like leading a horse. Manage people like you would lead a horse with care, love and patience. The delegation board is an easy tool people can use to communicate the type of delegation between a manager and a team, or between any two parties. This tool can also help both parties be open and transparent about what they expect from each other. Most organisations use a formal process involving performance appraisals as the main (or sometimes only) way of “evaluating” the performance of employees. The performance appraisal is described as a mandated process in which, for a period of time (often annually), an employee’s work performance, behaviours, and/or traits are rated, judged, and/or described by someone other than the rated employee, and documented records are kept by the organization (Coens and Jenkins, Abolishing Performance Appraisals loc:402). Personally I used hate the annual/mid year review process (happy that do not need to go through it any more). First, it takes so much time, second, it doesn’t work. Nobody has been able to prove that appraisals will help organizations improve their performance in the long term (Coens and Jenkins, Abolishing Performance Appraisals loc:769). Fortunately, the innovative/adaptive organisations are getting rid of the performance appraisal overheads as it’s unsustainable in the light of the emerging globalized creative economy. Remote working, contract workers, Agile and Lean methods, and many other trends make it more and more difficult to organize formal performance evaluations between “superiors” and their “subordinates”. So, what can we use instead? Use a peer feedback as the main performance measurement. Contributions to a shared purpose are best evaluated by peers, not managers. I like the virtual currency bonus system Jurgen suggesting as traditional ones rarely have a positive effect on people’s performance. You can use credits, points or hugs. Virtual currency, in this case hugs, represents the merits that people can collect over time and then exchange for money. Everyone in the team (it’s easy to introduce this system in teams working together on a daily basis as people know each other well) collects hugs through a month, quarter etc. and then they can be exchanged to money and the bonus gets paid. For example one hug is one dollar. Note: The first and the most important thing you do before you introduce the new system is set up a safe-to-fail environment. More in the drawings. Enjoy! 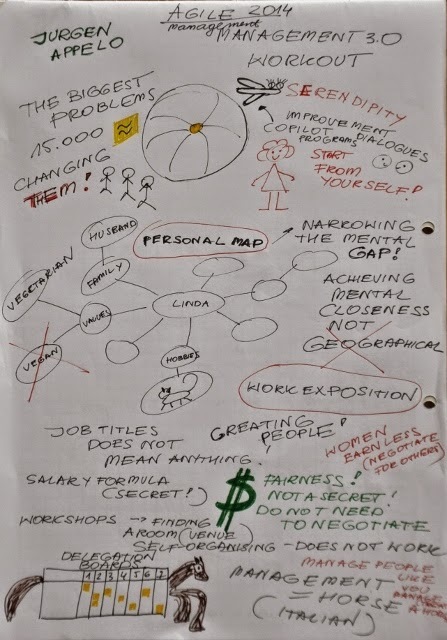 Visual Thinking – the Path to Genius? "How To Do Scrum, Quality Assurance in Scrum Projects"